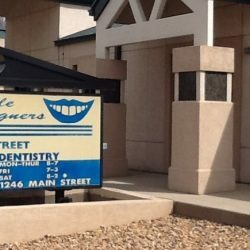 Our dental office is conveniently located on the southeast corner of N. Main St. and Mountain View Ave and is accessible via all the major roads. 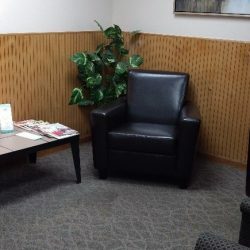 We provide gentle, family-oriented dental care to the adults and children of this community. Our friendly and competent staff is dedicated to patient comfort and quality of care. We are proud of our office, which fully utilizes state-of-the-art equipment. We have a modern sterilization system that surpasses OSHA requirements. The source of water for our dental units is distilled water (bottled water), which removes any chances for contamination from regular tap water such as that used in most dental offices. We provide the best and latest in dental technology and treatment options, using premier equipment sterilization techniques available to dentists. In addition to general dentistry and cosmetic dentistry, we work with specialists in periodontics (gum diseases), implant dentistry, endodontics (root canal treatments), and other specialists. With this team, we emphasize comprehensive, quality care and preventive dentistry. We look forward to welcoming you to our dental family! We accept most insurance plans and file most claim forms for you. We also accept payment from most PPO and indemnity plans. Please call our office to make an appointment and to ask any questions you may have. We accept all major credit cards, ATM cards, cash and personal checks. For our patients’ convenience, we have arranged a payment plan through CareCredit that helps our patients receive their treatment in a timely manner.